Chester, PA isn’t a city that is readily on everyone’s radar. Chester is a city of approximately 30,000, just 13 miles south of Philadelphia. What was once a thriving manufacturing city with a vibrant downtown, it is now an economically distressed city facing issues of poverty, disinvestment, white flight, unemployment and abandonment. In the early 1900s, Chester was a city that manufactured textiles, woolens, bricks, engines, irons, war contracts for shipbuilding and auto industries, and had companies such as Scott Paper, Baldt Anchor, Sunship Oil and even a Ford plant. They even had a sign above their downtown that said, “What Chester Makes, Makes Chester.” The city’s identity was intertwined with manufacturing. Post World War 2, there was no more need for wartime construction, manufacturing companies were bought or merged, racial tensions and riots occurred, and a changing population was left with significant challenges. The 1960s and 1970s were defined by civil rights and environmental battles (i.e. Wade Dump Fire on the first superfund site). In the 1990s and early 2000s, Chester received the Hope VI Grant for public housing upgrades; the SBDC and Chester Microenterprise Partnership was formed; non-profits began to fill the role of community outreach; the Chester City Blog began; and charter schools began to step in to fill the public school gap. Throughout its history, Chester has also dealt with the powerful “Republican Machine” that has almost continuously held power in this city. Chester reminded me that cities need to capitalize on what they have, honor what they have lost, stay connected to its history and creatively and collaboratively look forward to what you have to gain as things change. Potential: 5 miles from Chester, Media, PA is a main street that serves of what Chester (and what Fulton Street in Fresno) could be. 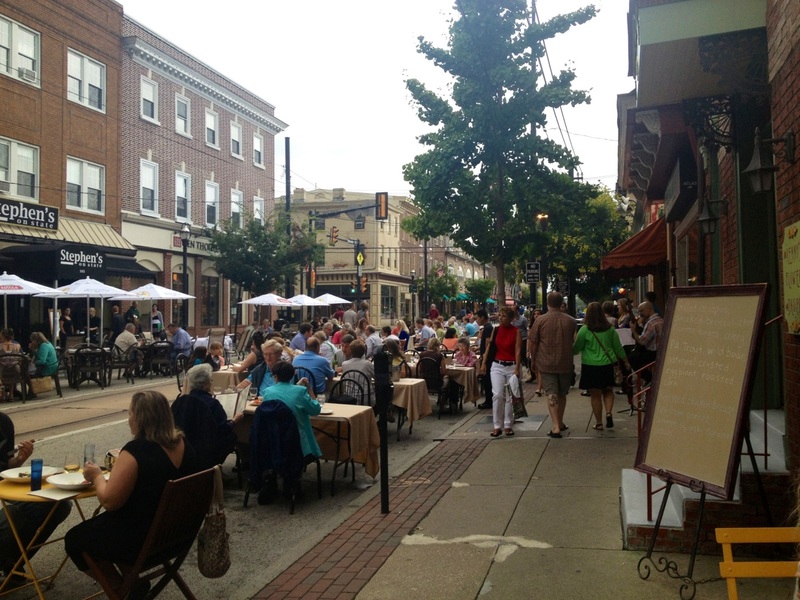 Wednesday night’s “Dining Under the Stars” is a successful event that shuts down Main Street traffic for outdoor dining.